Australia vs South Africa only T20 2018 has been played as a T10 cricket match in Carrara Oval Queensland on 17 Nov 2018. Aus vs SA T20 match reduced to 10-10 overs match due to rain. South Africa won this very interesting match by 21 runs. Andrew Tye, McDermott, Jason Behrendroff, Aron Finch(c), D Arcy Short/Saun Marsh, Chris Lynn, Alex Carey(wk), Glenn Maxwell, Marcus Stonish, Billey Stanlake, Nathan Coulter-Nile. Quinton de Kock(wk), Reeza Hendricks, Faf du Plessis(c), Chris Morrish, Heinrich Klassen, Devid Miller, Andile Phelukawayo, Fehran Behardien, Kagiso Rabada, Lungisani Ngidi, Tabrez Samsi. South Africa has had won the very first match of this series by 6 wickets. While Australia won the 2nd ODI Australia vs South Africa 2018 by 7 runs. This 2nd ODI match was a very interesting match. Both the teams are the best and strong team of the world. They have a good combination of good batsmen and bowlers. Chris Lynn, Aron Finch, and Alex Carrey are good form batsmen of Australia. Rabada and Pretorius performed well in the 2nd ODI cricket match. They got respectively 4 and 3 wickets in that match. South Africa won the 3rd and final ODI cricket match by 40 runs. In this way, South Africa has had won the ODI series by 2-1. Australia won the toss and opt to bowl first. 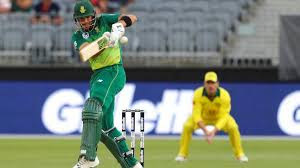 The batsmen of South Africa played a great and blasting inning for their team. RSA scored 108/6 in 10 overs. Quinton de Kock scored 22 runs with the help of two massive sixes. Faf di Plessis the captain of RSA scored 27 runs in which he smashed 4 boundaries. Hendricks 19, Klassen 12 and Miller supported with 11 runs to reach this score 108/6. Andrew Tye and Nathon Coulter-Nile got the 2-2 wickets while Stanleke and Maxwell got the 1-1 wicket for Australia. Australia got the winning target of 109 runs to win this Aus vs SA T20 2018 cricket match. Only Glen Maxwell of Australia could play a great inning of 38 runs. He smashed 2 boundaries and the same number of sixes in his 38 runs. Chris Lynn also supported with 14 runs. But other players couldn't score the runs in double-figures. Australia could score only 87/7 in 10 overs. In this way, South Africa won this Australia vs South Africa only T20 2018 cricket match by 21 runs. Lungi Ngidi, Chris Moris and Fehlukwayo got the 2-2 wickets while Tabrez Samsi got 1 wicket for RSA.